Your product will make it to market faster using our lineup of die fabrication services. From die design for new product development through design build and all the way to high-speed in-house production, Team Storm can help. Which metal type does your die require? Copper, brass, aluminum or steel? 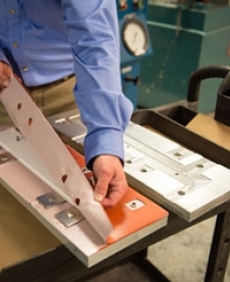 Inside the die fabrication work center, Storm electrical engineers and technicians specialize in completing complex custom die design and fabrication for a wide variety of applications using an array of metal materials. Custom die fabrication under our roof has its benefits. Flex-Tooling equipment speeds up the production of OEM custom copper connectors and eliminates the need for expensive hard die tooling costs. Hard dies for copper fabrication can be quite costly. In order to justify that cost it must be tied to a very large order to amortize the cost to a reasonable per unit price. Using Storm’s electrical component Fabrication services, you’ll create synergies. Tools are designed and built in-house with materials made in the US. With our equipment, we create a top and bottom template, and then install the required punches and notching components, which function exactly like a hard die. And, when the project is completed, we uninstall the reusable components and put the templates into our collection of several hundred already on hand. *Customers do not receive a tooling charge, unless there is a very unusual aspect to an order. We are resourceful, streamlining processes to achieve workflow efficiencies.